The new Peugeot 3008 SUV was revealed at the Paris Motor Show in September 2016. Set to go on sale in the UK in early 2017, Peugeot says the car will be the most advanced Peugeot ever sold, with plenty of in-car tech and a lower overall weight compared to its predecessor to improve the car’s economy and handling. 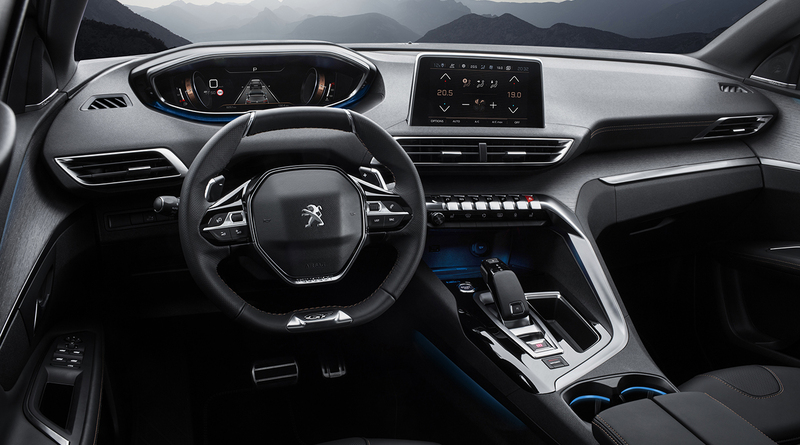 The completely new Peugeot 3008 will be the first production car to use the firm’s new version of its i-cockpit digital instrument display and infotainment system. We expect it to become one of the best in class when the car is launched. Owing to the drop in the car’s weight, Peugeot is confident the car is better to drive and more efficient. Interior space is also up compared to the previous 3008. The new 3008 will be available with two petrol and four diesel engines, and trim levels will include GT and GT Line. The original 3008 was a mix of MPV and SUV, but the one on display in Paris is much more an SUV, allowing it to compete directly with rivals such as the Volkswagen Tiguan, Nissan Qashqai, Ford Kuga and Renault Kadjar. 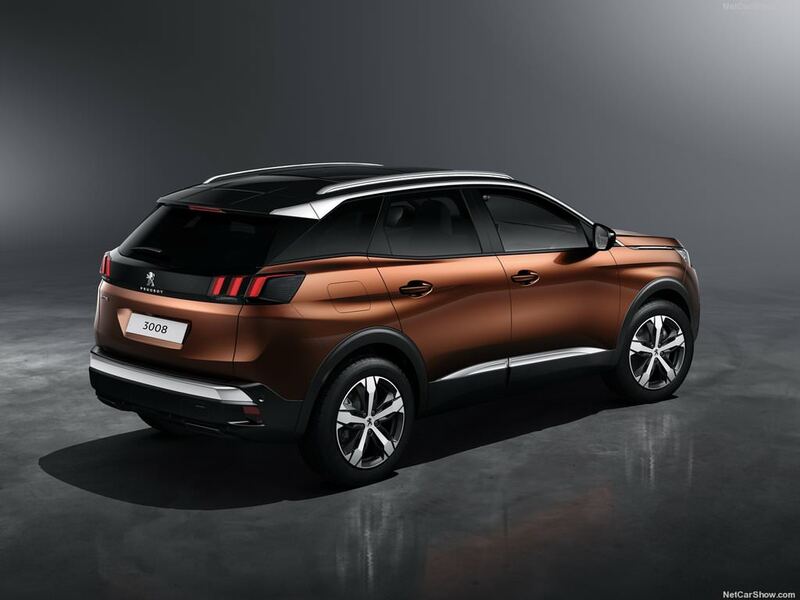 The new 3008 has already been crash tested by Euro NCAP and achieved the full five-star safety rating, thanks in part to safety technology like lane-departure warning and speed-limit assistance systems. The car will be available to order in November and exact specifications and prices will be released near the time. The new Peugeot 3008 is instantly recognisable as an SUV, with a raised ride height and a bold front end. There’s plenty of chrome too, with the shiny metal surrounding the grille and foglights, while there’s also an eye-catching front protective skid plate. The sharp headlights are cleaved in two by a piece of the front bumper, while creases abound on the bonnet and down the side of the car. Black plastic cladding around the wheelarches and at the bottom of the doors lends a rugged appearance. The roof and roof supports are available in contrasting colours, giving the appearance that the roof it floating. Chrome trim runs from the front windscreen support over the roof to the rear spoiler. The rear light clusters are divided in three, and the upper part of the tailgate is finished in black and the bottom half in body colour. The rear bumper is a combination of black plastic and chrome. There’s more space inside the 3008 than before despite the car’s external dimensions being reduced. That’s largely due to it having a longer wheelbase, meaning there’s a longer gap between the front and rear wheels. There’s plenty of space in the rear seats, and the boot measures an impressive 520 litres when the rear seats are in place; substantially more than you’ll get in the Nissan Qashqai or Renault Kadjar. Fold the seats, and boot space grows to 1,580 litres. The Peugeot 3008 is claimed to have class-leading connectivity, with technology including wireless smartphone charging and MirrorLink compatibility (a system the mirrors your smartphone’s screen on the car’s own screen). Android Auto and Apple CarPlay will also be available, allowing you to control many of your smartphone’s apps from the car’s touchscreen. The new 3008 will also be the first Peugeot to feature the firm’s second-generation i-Cockpit system. It’s a digital instrument display that replaces the car’s analogue dials and can be configured with a range of information including speed, fuel economy, available range and sat-nav instructions. The system is similar in concept to Audi’s Virtual Cockpit. The new Peugeot 3008 engine range comprises of two petrol engines and four diesels. The petrol range is made up of a 128bhp 1.2-litre engine and a 163bhp 1.6-litre unit. The four diesel choices are a pair of 1.6-litre engines developing 98bhp and 118bhp and two 2.0-litre engines producing 148bhp and 177bhp. The most powerful petrol and diesel engines will only be available with a six-speed automatic gearbox; the rest of the range will have six-speed manuals. We’ll have to wait until November for information on running costs, but Peugeot has already said at least one diesel engine will emit less than 100g/km of carbon dioxide, making it exempt from road tax. The 2017 hybrid 3008 will feature a small petrol engine powering the front wheels, and electric motors powering the rear wheels. It’s likely this technology will be at the expense of some of the car’s boot space. Two trim levels will be available when the car goes on sale. The new Peugeot 3008 GT Line will feature LED headlamps all round, wireless inductive charging and satellite navigation. It’ll also come with the ‘Safety Plus Pack’, which comprises blind spot detection, lane keeping assistance and a driver attention alert system that can detect the driver’s level of fatigue. There are also adaptive headlights that automatically adjust their beam to stop them from blinding oncoming traffic. The Peugeot 3008 GT model will come with the most powerful engine in the range – the 177bhp 2.0-litre diesel – and a six-speed automatic gearbox. The GT includes 19-inch alloy wheels, a panoramic sunroof, a synthetic leather interior with contrasting stitching, and seats with electric adjustment and a massage function. Other standard-fit equipment includes adaptive cruise control, which can keep a set distance to the car in front on the motorway, and an electric tailgate that can be opened by waving your foot under the rear bumper. The 3008’s high standard of built-in safety has already been proven with a five-star result in independent Euro NCAP crash testing. This excellent result is partly thanks to the impressive roster of safety features fitted across the range, which includes speed-limit sign detection and recommendation. Other advanced systems include active safety braking and a collision warning system. This is linked to an automatic emergency braking system that lessens the severity of impacts or avoids collisions altogether by reducing the car’s speed when an oncoming hazard is detected. Lane-departure warning and an attention assist system are also available, as is automatic high-beam assistance, dipping your headlights automatically to avoid dazzling oncoming drivers. However, we’ve not ret received confirmation as to which systems will be standard on each trim level. Another practical feature available on the 3008 is parking assistance, which allows the car to steer itself into a parking space, leaving you to just operate the pedals. One novel option is the electrically assisted ‘e-kick’ scooter. It folds and stows in the car’s boot when not in use and can be charged there using a docking station while the car is being driven. It has a range of 7.5 miles and takes an hour to charge. Peugeot says that with a top speed of 15mph, it’s intended to make journeys through city centres easier. There’s no word on price yet, however. Mods pls close n merge this pls. bro y aiyo, unless u lamentin like me - y these not so reliable brands design so swee yet jap cannot.. I searched already before I posted. This 3008 is a totally new platform. I think it deserves a separate thread. Exactly the reason why I posted my message. Suv look got better road presence. Edited by yokechye, 31 October 2016 - 10:22 PM. 2nd Generation Peugeot 3008 under Conti section. Aside to Radx, can you help to merge it? Thanks. you are right. Mod please delete my post. How reliable is Peugeot in Singapore? Saw this beauty last weekend as looking around for a replacement of my current car in Peugeot show room......Love it. Looking forward to test drive this baby.....Hope the price will remain competitive. Wah bro, information not very correct lay. I checked with the peugeot SE, the car is still in the warehouse waiting for LTA approval, not in the showroom for display. price should be around 130K ? Wonder what other suvs could be launched in the months ahead... Skoda Kodiaq if the make finds a new AD, Seat Ateca since new AD does not have any Suv here yet, and byd 's full electric taxi ermm.. Suv?